The parents of baby boomers generally embraced the Beatles at the beginning of the popular music "British Invasion" beginning in 1964 as cheery, wholesome, if somewhat mischievous lads. However parents universally rejected the Rolling Stones out of hand as unkempt, surly, uncouth and unruly slobs. On the last count anyway, with respect to the three original front men, Brian Jones, Keith Richards and Mick Jagger anyway, they were decidedly correct. If one visited their three room flat in Edith Grove in south London circa 1963, when someday being the "world's greatest rock and roll band" was merely a twinkle in Keith's eyes, you probably would have seen a lot of dirty dishes stacked in the sink, and at closer look, seen the mold growing on them. If somebody hawked and spat a huge gob somewhere, it would likely be circled and highlighted in ink. When the mess in the kitchen would get critically wretched they would "clean up" by chucking dishes out of their second story window to the courtyard garden below, much to the dismay of the building's other tenants. Nor were their neighbors particularly pleased when the nocturnal Stones would pull pranks, often instigated by the author, like removing the door of the common bathroom door for the building in the wee hours. That's right; the other tenants would get up early in the morning to go to work and head first to the toilet and - no door. Nice guys, the Stones, right? These affectionately (and truthfully) told stories come from one Jimmy Phelge, who lived with Mick, Brian and Keith during 1963 when along with band members Bill Wyman and Charlie Watts (and honorary sixth Stone Ian Stewart) they would gradually take first London, then all of the U.K., and finally America and the world by storm. Although decidedly not the best people to have as neighbors, they were in their starving artist phase then, absolutely devoted to American blues and performing as often as they could get bookings around south London, long after giving up on the idea of working day jobs. Mick even quit his studies at the London School of Economics to pursue success as a musician. Jimmy, a man notably hygienically challenged himself, was known for such pranks as greeting his three mates in the wee hours returning from a gig by urinating on them from the top landing as the trio tiredly climbed the stairs to their apartment. Unsavory as they were, the Stones were passionate about their music and refused to compromise their image to please others, especially after the first flush of success as their half American manager, Andrew Loog Oldham (son of an Eighth Air Force officer shot down over the English Channel during WWII), took over their image making. Early fans of the Stones noted that when all five members collaborated on a recorded tune it was credited to "Nanker Phelge." Nanker was a rude face Brian would make to horrify his elders; now you know where the Phelge came from. Soon Jagger and Richards were the second top writing team in pop music right after Lennon and McCartney and the Nanker Phelge credit began to dry up. But the Stones never lost their affection for this odd character, who never actually had a hand in the song writing. Towards the end of the book Jimmy tells about how he once cruised with Brian, who was now widely recognized around London due to the building fame of the Stones, near Piccadilly Circus in his lumbering Humber motorcar. Jimmy decided to throw a bouncing firecracker into the crowd but hit the window frame instead and from hence it ended up in the back seat. It began bouncing and exploding all over the car's interior as Brian panicked and nearly lost control of the vehicle. Served them right, I say! This is a great book for fans of the 1960s Stones told by somebody who truly knew them when. I look forward to reading bassist Bill Wyman's account of his years as a member of the band penned after he was already an ex-Stone, called STONE ALONE. First though, I need to finish the enjoyable book I'm currently reading about their friendly rivals, the Beatles. This book, about the very early days of The Rolling Stones (back when they were The Rollin' Stones) is very good. It's a hilarious quick-read, one that is a must for all Stones fans. The author shared a flat with the band just before they made it big, so unlike a lot of books written by reports or fans--this book felt more genuine. Though he lived with Mick Jagger, I did feel like the book was mainly about Keith Richards (whom the Phelge liked to raise hell with). Once the fame hits and the author is kinda "left behind" by his successful friends, the book kinda turns into a bummer. The author had no ill will towards his friends, but I couldn't help but feel bad for the guy (they couldn't formally offer to give this guy a job in their organization? Even with all those other hangers-on types? ).The book actually is less of a musical bio, and more of a "this is the disgusting/terrible things that young men do for fun" kind of books. The boys pee on each other. The spit on each other. They throw each others records out the window (as well as burning sheets and dishes). It both glamorizes the bohemian lifestyle but also paints it as less-than-ideal (they don't work and have fun, but they got no food and can't afford to drink anything stronger than coffee). The most surprising thing about the book *spoilers* is the lack of drug use. I was expecting to read all kinds of tales of joins and needles, but there was none. No one really got very drunk (as they had no money). Overall, I'd say this is best book of it's kind in that it was written by a friend of the band (so he knew them) but one who wasn't really helped by them financially (so he could tell the truth). Phelge was there at the beginning of the Rolling Stones' rise. You can't get any closer to a band than living with them in pre-fame squalor for a year. This book tells of the Stones rise, but what makes it great are the hilarious anecdotes and stupid inside jokes. Without being blatant, Phelge's everyday accounts have weighted significance. For example, you can sense that Brian Jones' alienation from the band starts with him not sharing his porridge and leaving the dirty pot for the others to clean or just throw into the neighbors yard. Maybe only great for Stones geeks, but its the most entertaining book about them this geek has read yet. 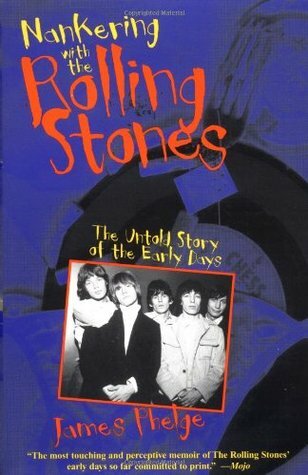 One of the most brutally honest biographies I've ever come across and as such easily the best depiction of the early life of the Stones. It's not a big surprise most of the occurences described in the book have never been told by any of the band members. At times Phelge makes the reader laugh uncontrollably and just a couple of lines further feel sentimental. Especially the afterwords can make one wonder how is it possible that a guy who once stood in the staircase urinating on his friends wearing nothing but underpants on his head is able to touch you with his memoir. What an amazing story. This is my favorite book on the stones. A realy personal view at the very start of there history. A fun read for real fans. This book is truly hilarious! This written by Mick, Keith, and Brian's roommate when the band was just getting started. Awesome read...Really gives you what the Stones were like in their younger and more rebellious days...Quite an eye opener, even for broad minded me.